The Vampire built in the greatest numbers was the FB.5. It was a single-seat fighter-bomber version, and unlike the earlier F.3, introduced clipped wing tips to the Vampire line. Powered by the Goblin 2 turbojet; 930 built for the RAF and 88 for export..
For many years we had but two injected plastic Vampires; one by Frog and the other by Heller. The Heller kit was the better of the two in terms of detail and the Frog kit easier to build. CMR did and still does an entire line of Vampires in their resin line and these are superb kits in their own right. But now the injected fans have a modern tool Vampire. Cyber-hobby decided to start the line with the FB.5, the one built int he greatest numbers. The kit is as uncomplicated as the real aircraft with the fuselage and wings in separate upper and lower sections. The engine intakes are a separate assembly and nicely done thanks to slide molding. The cockpit is a simple tub with the instruments molded in place. One simply adds the seat and control stick. The nose gear well is not open as it is on the real aircraft, leaving you room for the required nose weight. I should mention that the windscreen and canopy are separate so you can pose it open if you wish. The upper and lower fuselage center section is a separate piece, which leaves room for doing an Australian-built version should they wish. There are two inserts that fit into the upper wing and into those fit the one-piece tail booms. Landing gear and doors are nicely done with well done tabs on the gear doors to assist in gluing. The inner gear doors are molded to the gear legs. The only thing for under the wings are very large fuel tanks, the holes for which are already open in the wings. Again, I'll repeat that I wish model companies would not do this as some of us will not want these tanks installed and now we have to fill in the holes. 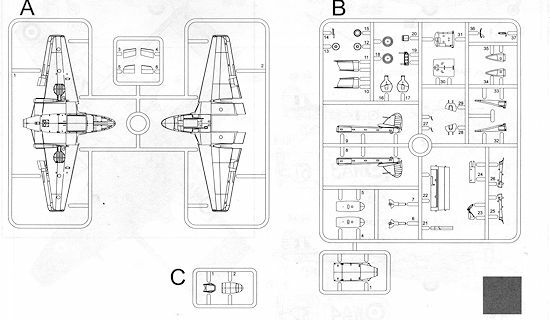 Instructions consist of but three construction steps, so this really is a simple kit. The kit provides markings for eleven different options in the 1953-1956 time frame. About half of them are painted in overall high speed silver including aircraft from 502 Sq, 202 Advanced Flying School, 185 Squadron, 16 Squadron and 603 Squadron. In camouflage are planes from 602, 603, 605, 607, 18, and 118 Squadron. 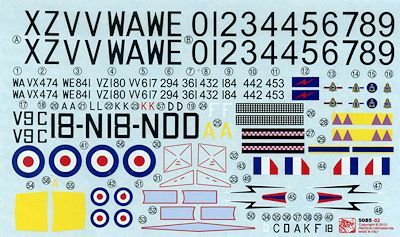 The decal sheet is packed with markings and surely one will be able to find something one likes from the choices. 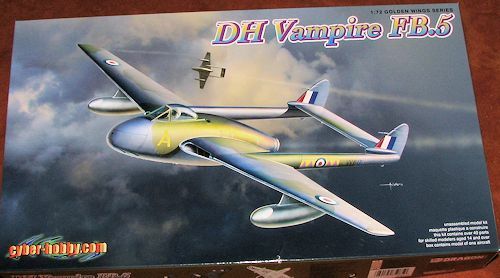 You can pack up or sell off your older Vampire kits as this one will certainly the the one to have for Vampire buffs. Pavla already makes resin bits for this one and SAC just released a set of metal gear for those so inclined. The aftermarket sheets certainly can not be far behind. I'll bet that you'll even see an FB.9 being kitted in the near future.